Will A Queen Size Mattress Fit On A Full Size Bed Frame? I just moved into an apartment and I have a queen size mattress. The apartment is providing me the metal bed frame but it is in the form of a full size bed. Is there a way to make a queen size mattress fit on a metal full size bad frame? Do you know the dimensions of a full size bed versus a queen size bed? The bed frame is metal and holds together easily. Do you think I can adjust it to fit my queen mattress? Find mattress sizes here. If it is an adjustable type of bed frame, meaning the metal type that can adjust to different sizes, then yes. If the metal bed frame is in the size position of a full bed… then all you have to do is loosen the fasteners (depending on type of bed frame) and readjust it to fit your queen mattress. It should be easy and fast. It MAY or MAY NOT be able to adjust to a queen size. Some metal bed frames can readjust and some cannot. If the frame was made from wood and was not adjustable, then the queen mattress will NOT fit on the full size bed frame. 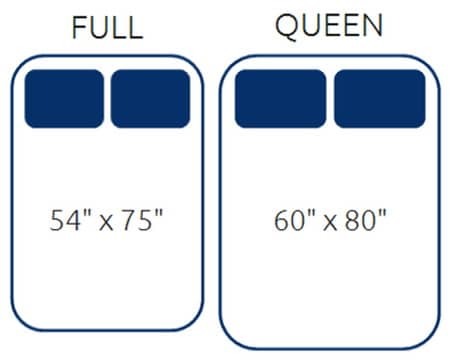 NOTE: Most full size metal bed frames can adjust out to a queen… and some go down to a twin size. The dimensions of a full size mattress is 54 inches wide and 75 inches long. The dimensions of a queen size mattress is 60 inches wide by 80 inches long. Since the metal bed frame dimensions are set for a FULL size mattress, you will need to loosen the fasteners and make the bed frame 6 inches wider and 5 inches longer so the queen size mattress fits. You do not have to adjust the bed frame very much. Have someone help you and use a tape measure to make it easier. If your bed frame is not going to be big enough for your queen size mattress, then look online for cheap queen size bed frames. You can buy a metal bed frame that adjusts from FULL to KING for low prices and get it the next day. It is cheaper to buy a new metal bed frame than a new mattress. You can look into full to queen converter rails. These rails make it possible to make a queen size bed fit on just about any full size bed frame made from metal. Need help finding out what mattress will fit on what bed frame? Please leave a comment below and we can assist. I have a Queen size timber slat bed with a brand new queen size mattress on it. I’m moving to a smaller unit and have been offered a double timber slat bed. Will the queen size mattress work on it? Ditto bedding, i.e. Sheets doona in short term, which can be changed over time.